Woke up this morning tired, exhausted and not really feeling like going out and getting a mile in. 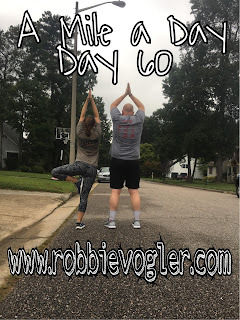 The reason I start today's blog post like that, is because even when you feel like you don't want to do something, sometimes the best thing that you can do is go out and get in a little run. Today's run wasn't the best, wasn't the prettiest, and definitely wasn't the fastest, but at the end of the day that stuff doesn't matter. 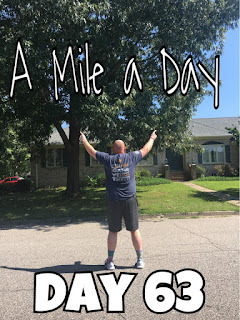 The reason I started this challenge 80 days ago wasn't because I wanted to get my mile time down significantly, not to train for a half marathon or even a race of any kind. It was solely just to go out to run a mile everyday for 30 straight days. 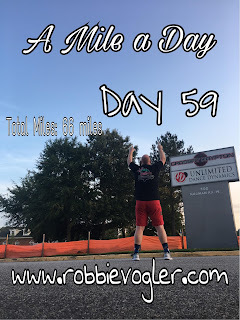 I have been grateful enough that it has lasted 50 days longer and I plan to keep it going until something literally keeps me from going out and running. I have mentioned it before, but even if you don't want to go for a run, go for a mile walk. It still counts. 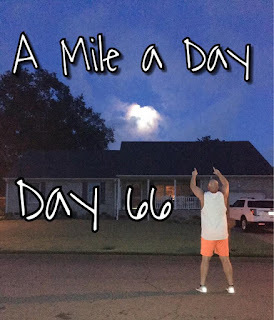 I want to to make the challenge again and I will continue to do this and I want to see how many people can actually stick to a "run streak" of at least a mile a day. When you start, don't worry about your time or anything like that, just focus on waking up everyday and making it happen. Period. End of Post. Verse of the Day: John 6:20, "But He said to them, 'It is I; do not be afraid.'" That verse I chose for today may be short, but it's so powerful. Not just from the context of the verses of Jesus walking on water. But just in life, Jesus is always there, even when life scares you, even when you feel like everything is crashing down, Jesus is always going to be there and it's a great reminder to not be afraid. Writing this has been a long time coming, and thats just because over the past couple weeks, since I last wrote a blog post life has been going a thousand miles an hour. While that's no excuse for not writing a little blog post daily, I'm back and going to try to get back into the swing of things everyday. If I don't get it done everyday, then every other day will have to suffice, but I promise no more of these two weeks between blog posts! Today's run was great, it's starting to get cooler in the mornings, which is a good thing, but also can be a bad thing also. The bad thing being, the sun doesn't wake up until after seven o'clock which makes it even more difficult to get up and get your run in. The past few days, I've been trying to get up early and get it out of the way, but I've also been running in pitch black the past days also. As we enter the fall and winter seasons it's going to get harder and harder to wake up and start your day off with a run. But I don't want anyone to lose sight of why I am doing this, or why you might be doing this. Starting this challenge in the middle of the summer has prepared myself for the hottest conditions and honestly I'm ready for the coldest conditions also. 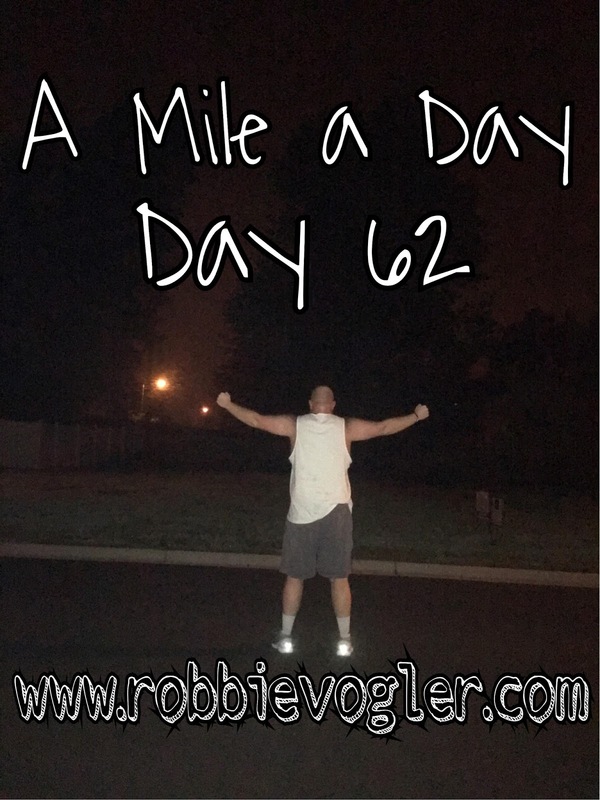 I didn't start this challenge to try to improve my mile run (it just happens to have decreased in time as we go on), I started this challenge to become more comfortable with running and that is exactly what has happened. I'm almost to triple digits, and I don't plan on stopping anytime soon! Also, today's run was I'm pretty sure my quickest one so far, 9:13. Passage of the Day- John 4:13-14, "Jesus said, 'Everyone who drinkings from this water will get thirsty again. But whoever drinks from the water that I will give him will never get thirsty again--ever! In fact, the water I will give him will become a well of water springing up within him for eternal life.'" Thank's for checking in everyone, I do apologize for being MIA for the past couple weeks but I haven't missed a day! I keep posting things on social media if you want to go check that out! Thank you! Good Morning folks! As you know I'm heading to Colorado this weekend for an event and I could not be more excited! I am going to do my best to get in a run each day that I am away until I get home on Monday. While I am away like I said the other day, you can follow me on all social media platforms to see how the trip is going. I'm going to try and do a blog or two while I'm there, but I will not have much technology with me except my phone and iPad, so the blog post will probably be short if they are going to exist at all. Today's run was a good one, I woke up a little before 6 and figured I would wake up and get the run over with so I had the rest of the day to relax before I head up to DC to see a buddy and fly out tomorrow morning! It was really nice and chilly, but also pretty dark, as you can see in my picture below, the moon was still shining bright and it almost made it difficult to get out of bed and actually start my run. But I'm really glad I woke up and got it done. I know it is probably difficult for a lot of people to wake up early and workout or run, but I promise once you get into a great routine and you just keep plugging away, it becomes easier and easier! Passage of the day: Luke 20:17-18, "Jesus looked directly at them and asked, 'Then what is the meaning of that which is written: 'The stone the builders rejected has become the cornerstone'? Everyone who falls on that stone will be broken to pieces; anyone on whom it falls will be crushed.'" I encourage everyone to go back and read the entire passage of Luke 20:9-19. It's the Parable of the Tenants, I thought it was a really great passage. Thanks again everyone for checking in and we'll do it again once more tomorrow! My post over the next few days may just be a quick excerpt from my run and a bible verse. Keep it locked here! What's up everyone! I know I didn't post yesterday and I apologize for that, but yesterday's run did happen, and it was a good one. I had a crazy busy weekend as you all have seen and my week is about to get even crazier. I'm heading to Colorado this weekend for the USAFF National Championships and I do still plan on getting my runs in, whether it's just a walk around, or maybe I'll explore Colorado a little and give you some updates on that. But I will try to do my best and update you, I'm probably going to be posting a lot on social media over the entire weekend. So Instagram, Twitter, Facebook all that will be plastered with updates on how things are going. But today's distance was covered by a walk, I posted a couple weeks ago about how somedays it's okay just to rest and the most important thing is to just get out and move a little bit. So that is exactly what I did this morning. My body was tired and I felt like today would be a perfect day to rest the legs from a run and decided to walk around for a little bit. Felt good and I got it in, I know a lot of people out there who are starting to get into the running challenge and I'm so excited to hear everyones stories along the way. YOU can do it, whether you hate running, or you don't mind running, you can do at least a mile a day. What did I listen to? Something to Wrestle with Bruce Prichard. Verse of the Day: (From Today's Devo) John 1:14, The Word became flesh and dwelt among us, and we beheld His glory, the glory as of the only begotten of the Father, full of grace and truth." Below you'll see the picture from yesterday. Since I didn't take a picture today I figured this would suffice. Thanks everyone for checking in and we'll do it again tomorrow! So let me set the stage for the day, then I'll get back to my run. I've got one of the longest days ever, working this morning from 6am-10pm. So I had to think to myself, how in the world am I going to get my run in? 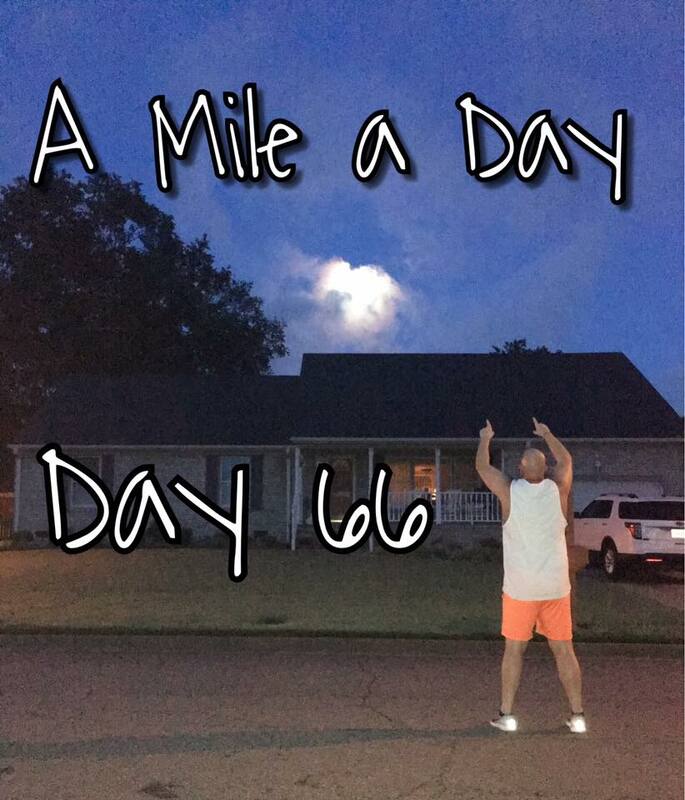 I've been running for 61 days straight, I can't just stop at 62. Last night before I headed to bed I told myself, "I'm going to set my alarm for 3:30 and if I wake up and I'm tired, I'll go back to sleep, but if I feel okay, I'll wake up and run." Well long story short, I woke up this morning at 3:30am and got my run out of the way. It was incredible, I swear that I caught the perfect time right before it got humid that it was so nice and cool outside, and it just felt great! I woke up thinking, this could be the biggest mistake of the day but I would have felt pretty lousy if I didn't wake up and get my run in this morning. Anyway, it felt great and I didn't time myself, but I'm pretty sure my time was close to 9:30ish, which is a very good time for me, and especially since I probably looked like a zombie, I'll take it. Verse of the Day: Luke 16:10, "'Whoever is faithful in very little is also faithful in much, and whoever is unrighteous in very little is also unrighteous in much.'" 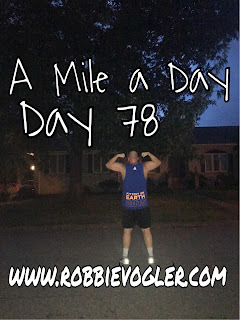 Thank you all for popping in and reading today's blog, I know it probably sounds like I'm saying the same things over and over, but it really helps when I can share how my run went with everyone during the day. I've heard some stories of other's around the country starting to run because of what I've been doing and I'm blown away. Keep going and if you want to start your own running streak, start at Day 1, you won't be sorry. It's always such a nice day when I get to run with someone. Especially when that someone is the girl I love so much, my girlfriend Katie. It was actually really nice outside to go for a run, we were a little nervous that it was going to start raining on us right in the middle and we would have to attempt and sprint the remainder of the run but it actually held off, and as of right now as I write this blog, it still hasn't rained yet. I know I've said this a million times, but I can't say it enough just how much running used to scare me over 2 months ago, but can you believe that on September 1st I've been running for 60 days straight. 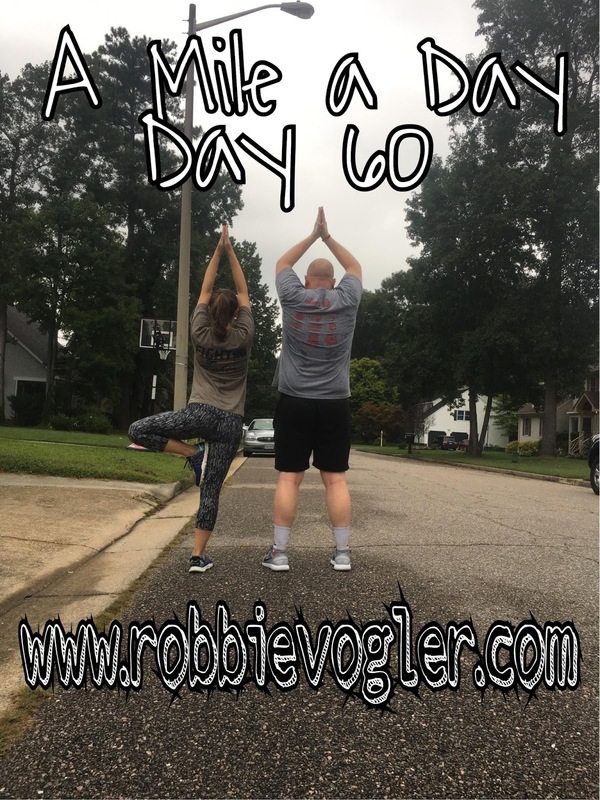 I find it hard to believe sometimes that I have been doing this for that long, but sure enough it's been a really great 60 days. Have all the runs been amazing, heck no. 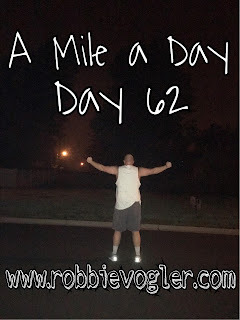 But I'm still getting out there and doing at least a mile a day and will continue to for as long as I can get it in! My schedule is about to get really busy flying all over the country and being on the road for events, I think it's going to be the toughest to keep it going through that, but I'm up for the challenge and do not want to stop anytime soon. I say we take it to triple digits, who's with me? Until then, we'll just take each day as they come and right now I'm focused on Day 61! Passage of the Day: Luke 15:8-10, "'Or what woman who has 10 silver coins, if she loses one coin, does not light a lamp, sweet the house, and search carefully until she finds it? When she finds it, she calls her women friends and neighbors together saying, 'Rejoin with me, because I have found the silver coin I lost!' I tell you, in the same way there is joy in the presence of God's angels over one sinner who repents.'" 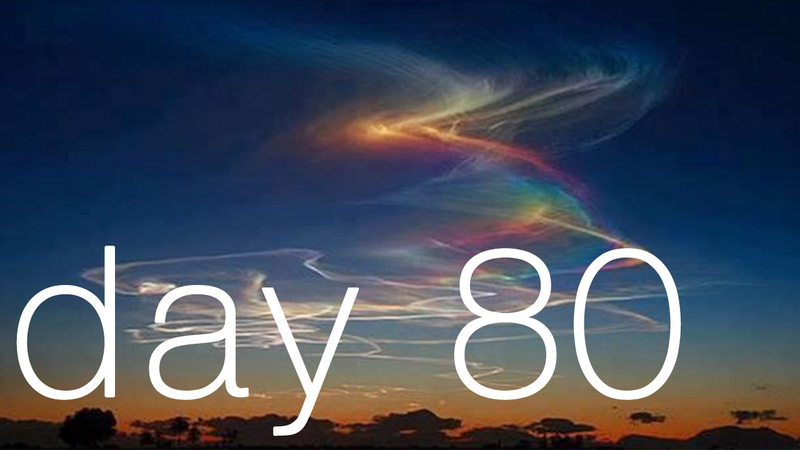 Another day is down, and the next few days are going to be later runs! Hopefully the weather holds up and it's going to be an amazing run! See you tomorrow! Today I decided to go do my run at CrossFit Krypton, which is one of my favorite places to be, with some of my good friends and able to catch up with people I haven't seen for a little while. It was perfect because I was having Christian Becker on my podcast (The Big Red Express), and it was a good chance to get my run in before our chat. It felt like a really quick run, which made it a little bit better, I felt great and since I hadn't run that route since Memorial Day, felt good to switch things up and have a little change of scenery. I gotta do that more often. 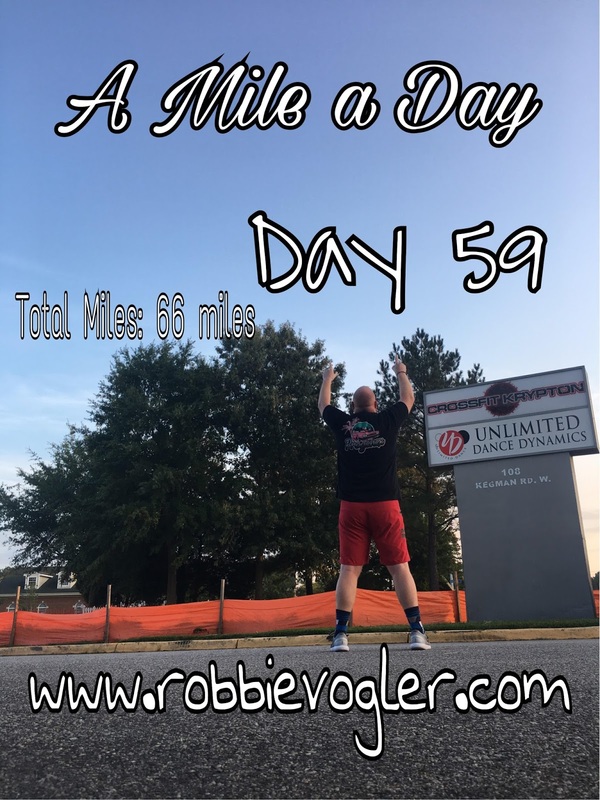 I wanted to say something about running, I recently read an article on Runner's World, about a lady who has been running for over 250 days in a row. I look at that number and I'm like HOLY COW, how do you run for that many days in a row? But then I look at my streak so far, and I'm thinking that exact thing. How have I been able to run at least a mile everyday for the past 59 days. Along with this article that was posted on Facebook, people started leaving comments about how bad running is for you, and is for your body and that you shouldn't run day after day after day. And in some cases I agree with that, but to comment about that on a post that is praising someone who has changed her life and that has made her life better by running each day I think is a pretty low move. Why can't we just congratulate people for doing something that is hard to do, for sticking with something that isn't easy. I don't want to ramble too much, but I wanted to personally send a congratulations to April Rueb for continuing to run for 250+ days. I hope the streak is still going and I hope it continues for a long time! If you want to check out the article you can CLICK HERE. Anyway, today's run was a good one and I'm glad I decided to head to CrossFit Krypton and knock it out! Passage of the Day: Luke 14:8-10, "'When you are invited by someone to a wedding banquet, don't recline at the best place, because a more distinguished person than you may have been invited by your host. The one who invited both of you may come and say to you, Give you pace to this man, and then in humiliation, you will proceed to take the lowest place. But when you are invited, go and recline in the lowest place, so that when the one who incited you comes, he will say to you, Friend move up higher. You will then be honored in the presence of all the other guests. For everyone who exalts himself will be humbled, and the one who humbles himself will be exalted.'" Thank you for checking in to today's blog and as always, I couldn't do this without the outpour of love and support along the way. We'll do it again tomorrow and I don't know about you, but I am so ready for some cooler weather! 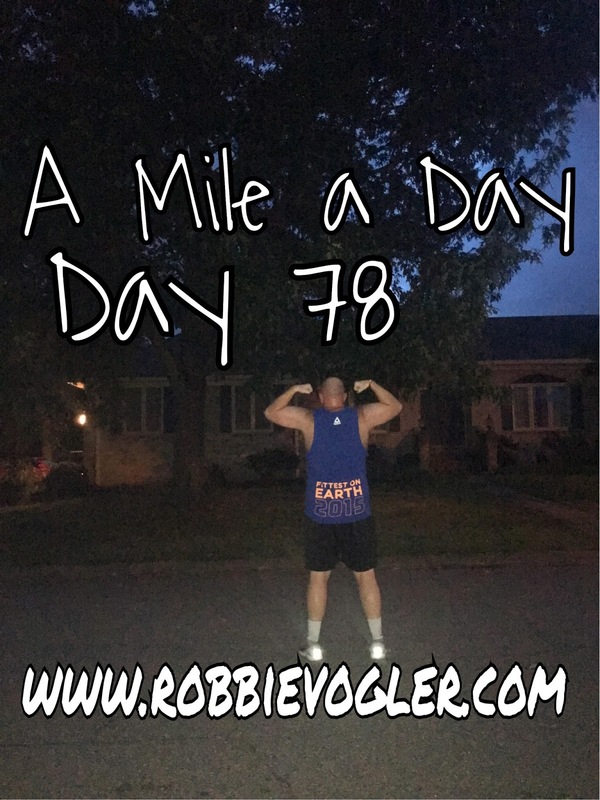 Subscribe To A Mile a Day!